Hailing from South Korea, BTS is one of the biggest bands in the world. Their latest single “IDOL” had thebiggest YouTube 24-hour debut of all time. 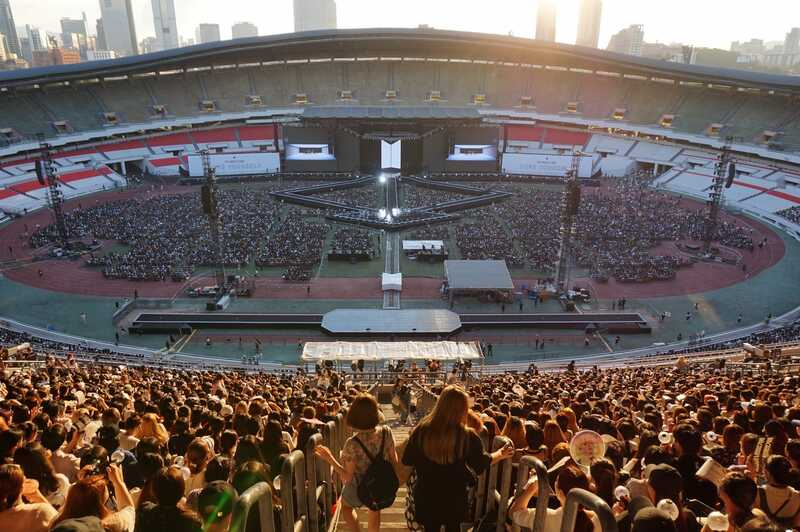 I was lucky enough to get a ticket to the opening concert of the group’s “Love Yourself’ world tour, which kicked off in Seoul, and it was truly crazy. 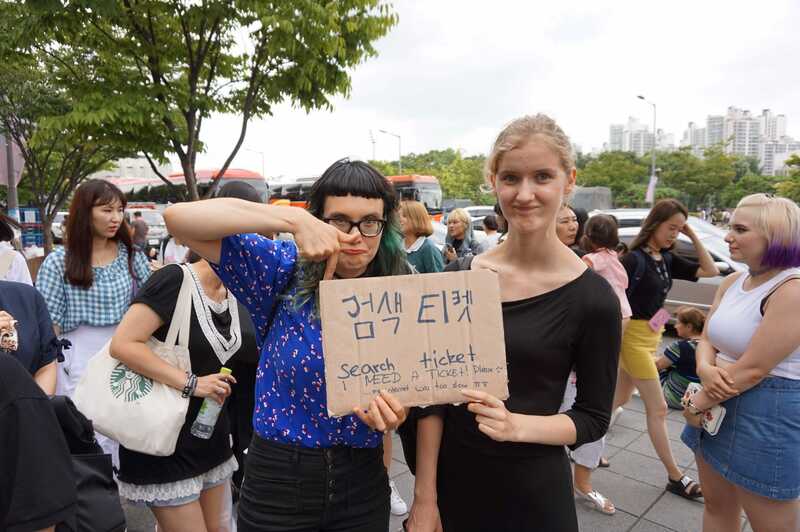 Getting a ticket itself was a scary experience: I was scammed and even blackmailed by fans into trying to give up my ticket. Outside the stadium, many had been camping for days to get hold of merchandise. And inside, I was booted out for snapping several photos. The overall experience made me realise how protective and obsessive fans can be about their favourite K-pop idols. 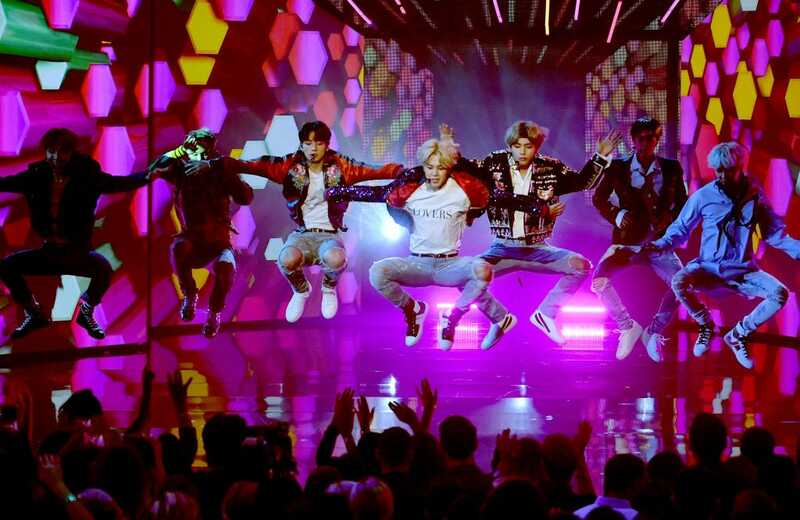 Forget “Gangnam Style” and PSY: the boys from BTS are the undisputed kings of K-pop. Unless you’ve been living under a rock, you’ll have heard about Bangtan Sonyeondan, also known as the Bangtan Boys or BTS. Debuting in 2013, the South Korean group has been all over the internet in recent years, breaking record after record in the global music industry. Anything they touch goes viral – including appearances on The Ellen Show. Their latest single “IDOL” raked over 45 million views on YouTube in its first 24 hours of release, earning the largest first-day debut in YouTube’s history by knocking off Taylor Swift’s 2017 single “Look What You Made Me Do,” which earned 43.2 million views in 24 hours. “IDOL” also has an alternative version that features Nicki Minaj. The group’s album “Love Yourself: Tear” debuted at No. 1 on the Billboard 200 album chart in May, making it the highest-charting album in US history for a K-pop act. 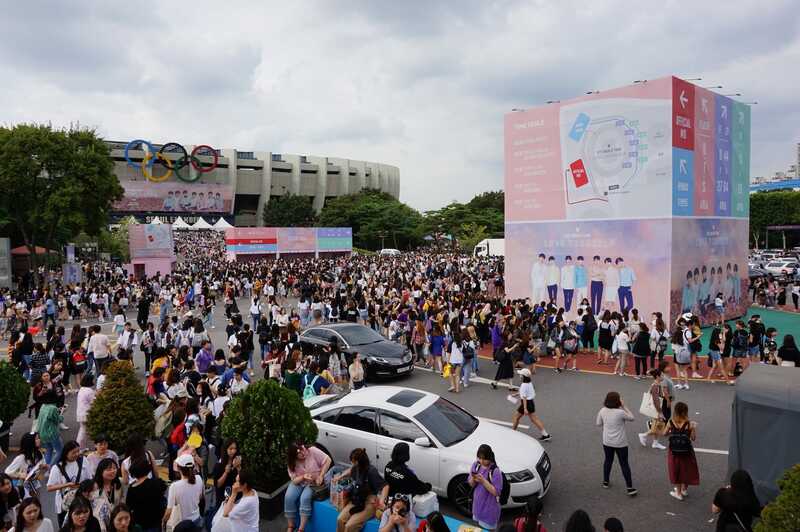 BTS owes their success to their die-hard fan base, dubbed the “Army,” which stays busy on social media, spreading the BTS message around the world and generating millions of clicks, views, and BTS-related retweets. The group’s “Love Yourself” world tour kicked off in Seoul in August and will pass through the US, Europe, and Japan through February. All of the tour dates are currently sold out. I was lucky enough to get a ticket to the opening night on August 25 in Seoul. But as I found out, BTS fans will employ whatever means possible to get their hands on tickets – including blackmail. 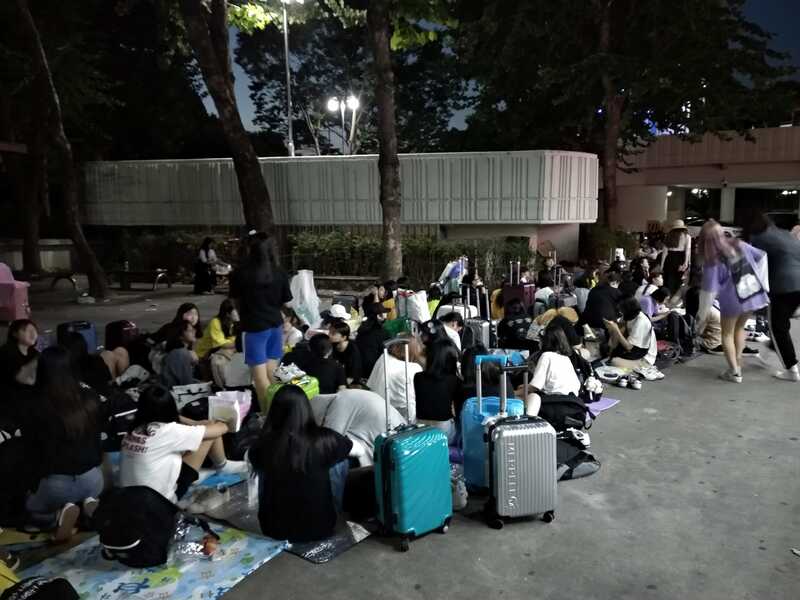 Here’s how I got a ticket, the scene outside the stadium, and how my experience of the concert unfortunately lasted for less than 20 minutes. With tickets having sold out in seconds, I resorted to going online to find resale ones. They were of course selling for several times face value, but I thought to myself, “But this BTS,” and convinced myself to go. 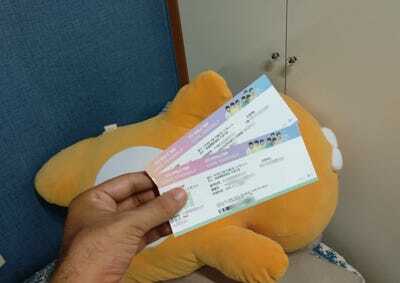 Raphael Rashid/Business InsiderThe golden tickets to the BTS concert. Considering I had all her private details, I told her I would report her to the police if she didn’t send it. Considering she was (probably) a high-school student, she freaked out and finally sent the ticket. I documented the whole saga here). When I received the ticket, the next plan was the resell it. I was bombarded by private messages from BTS fans who posed as potential customers, and then told me if I didn’t give the ticket to them for cheaper, they’d report me to the police for scalping. For the record, ticket reselling online is entirely legal. It’s just that you cannot resell outside concert venues. Eventually, I was able to sell the ticket for no profit, but was already curious as to how the concert would unfold. 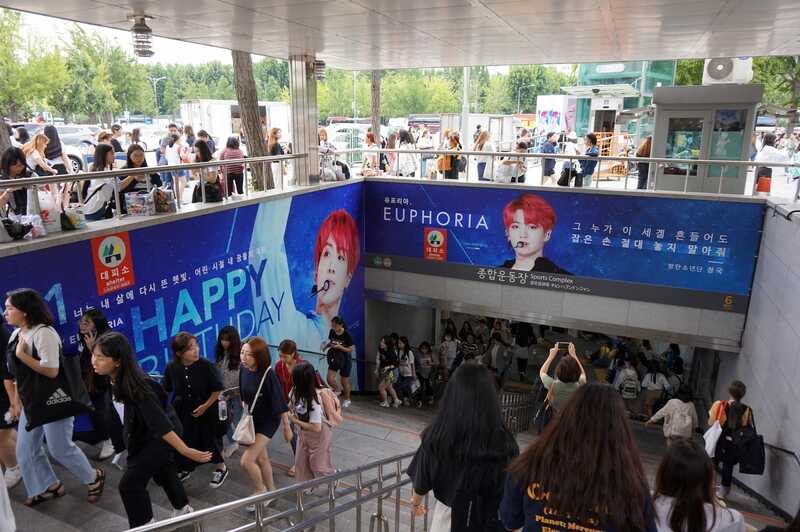 There was already euphoria in the air as I arrived at Sports Complex Station located in Jamsil, Seoul, early in the afternoon of August 25, the day of the opening gig for BTS’ “Love Yourself” World Tour. The station was packed, and the exit was decorated with a massive poster of BTS member Jungkook to celebrate his birthday on September 1. Raphael Rashid/Business InsiderSports Complex Station, Jamsil, Seoul. 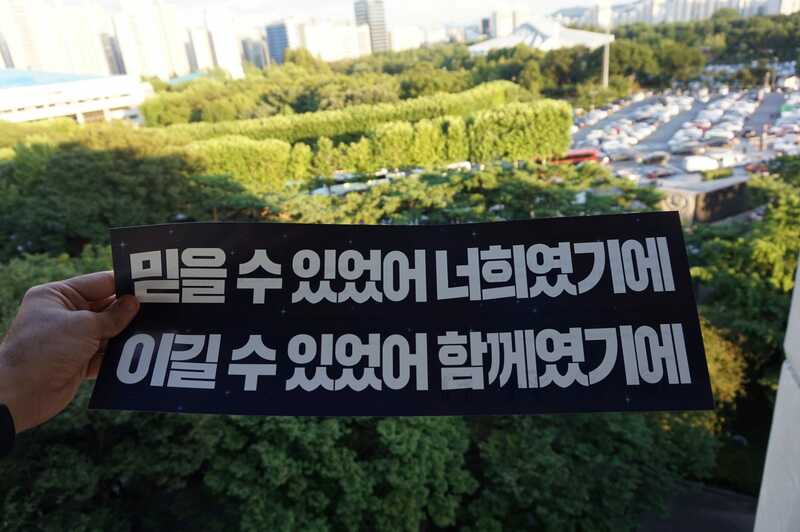 Note: These banners are paid for by BTS Army fans – not just in Korea but around the world. Outside the station, I literally could not move. 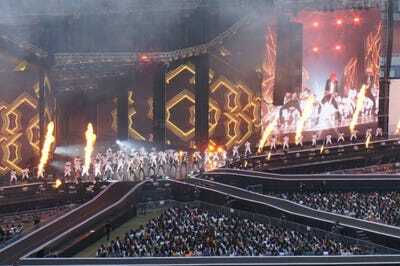 The concert was going to take place at the Olympic Stadium located hundreds of meters in front of me. I’ve been to many concerts at this stadium including Lady Gaga, but cannot remember seeing this many people — and so early in the day. Raphael Rashid/Business InsiderCrowds as far as the eye can see. 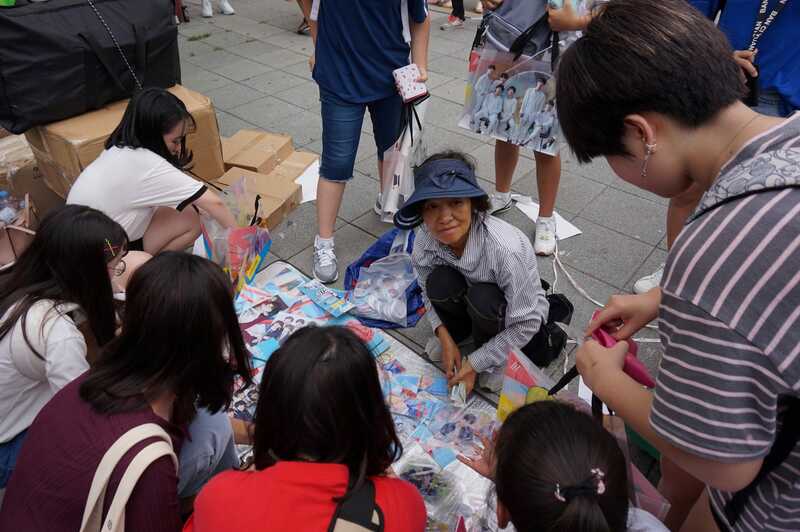 Business was brisk for vendors selling unofficial merchandise. BTS fans were hurriedly grabbing whatever memorabilia they could. The cash was flowing. Raphael Rashid/Business InsiderStreet vendor at BTS concert. 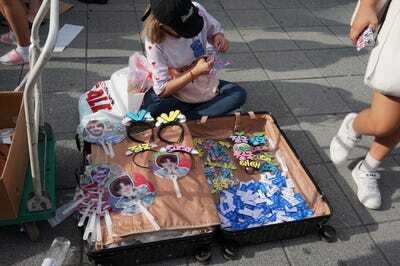 Raphael Rashid/Business InsiderSelling memorabilia at BTS concert. Raphael Rashid/Business InsiderHomemade BTS merchandise. There’s no denying it: BTS is a global megahit. Some Koreans even say the Bangtan Boys are more successful outside Korea. 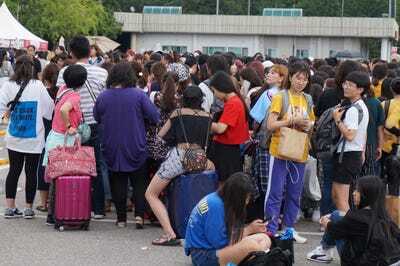 Many non-Koreans, exchange students, and BTS tourists made it to Jamsil, even without tickets, which sold out in seconds. Here Salle and Samira from Germany were desperate for tickets, willing to fork out hundreds of dollars to get to see their favourite band. Raphael Rashid/Business InsiderFans desperate for tickets. 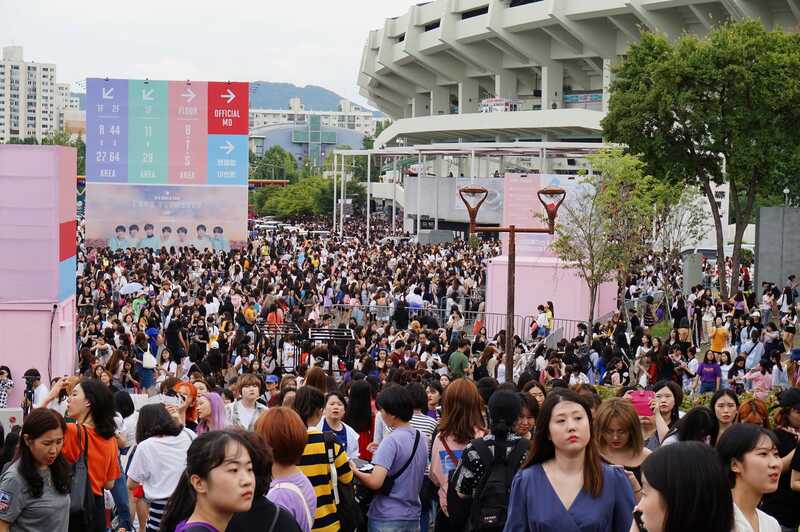 In front of the Olympic Stadium, the crowds were getting slightly ridiculous, considering there were still four hours to go before the concert actually started. 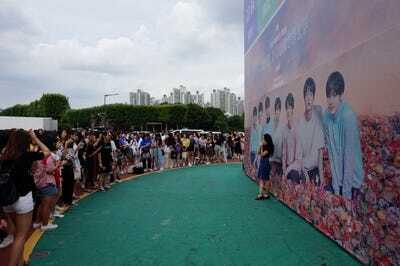 A massive photo wall panel was set up too, with fans flocking to all take selfies. 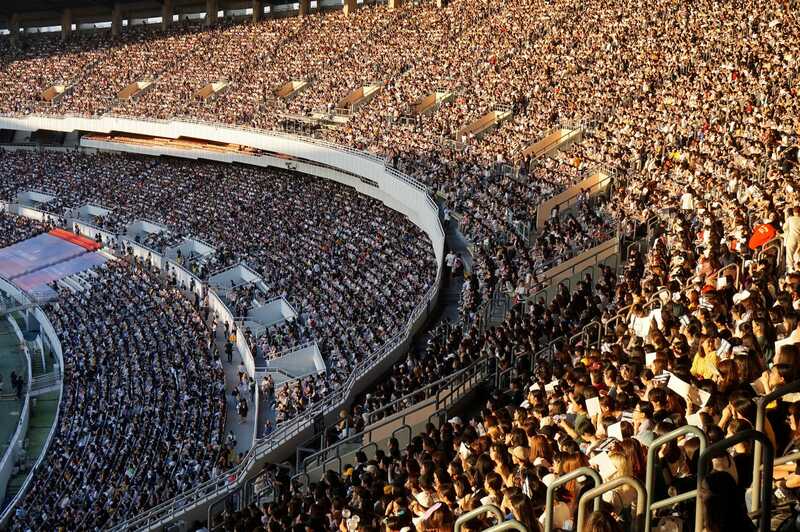 Raphael Rashid/Business InsiderView in front of Seoul’s Olympic Stadium. Raphael Rashid/Business InsiderBTS photo wall. Seriously, at one point I felt like there were more people outside than could fit inside the stadium. But like I said, this is BTS we are talking about. As I would later find out, fans for the next day’s concert had also come that day to partake in all of the day’s excitement. Raphael Rashid/Business InsiderScene outside Seoul’s Olympic Stadium. 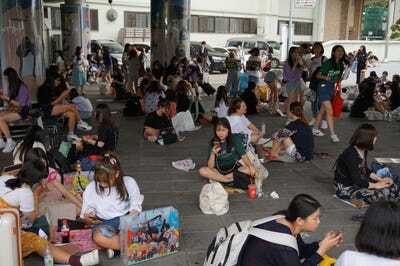 Wherever I looked, the place was filled with fans who had set up base outside. Some were practicing the lyrics to the group’s new single, “IDOL,” which had been released less than 24 hours prior. Others were applying makeup, and some were rummaging through their suitcases. Raphael Rashid/Business InsiderBTS fans everywhere. The lines for the official merchandise were insane. Organisers had to transform a parking lot into a massive makeshift camping site. I asked around. 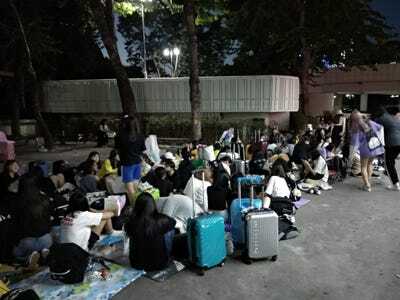 Some had been waiting since morning, others since up to two nights before. Many had suitcases. Raphael Rashid/Business InsiderLine for BTS official merchandise. 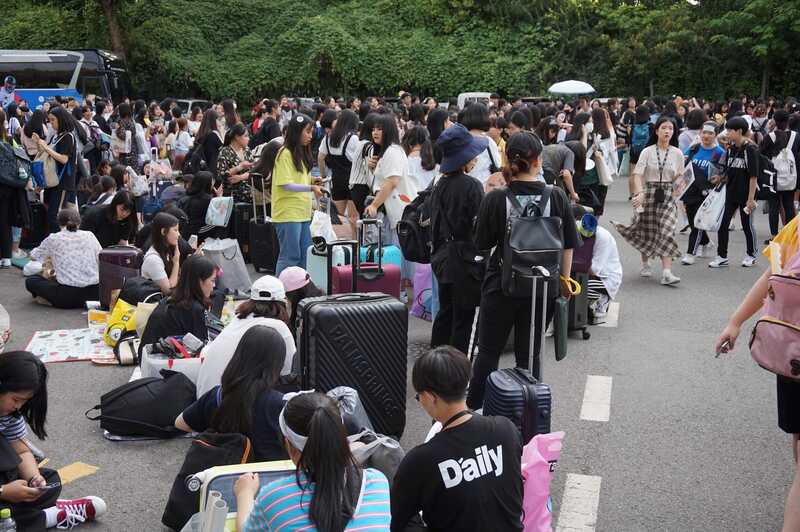 Seriously, they slept overnight despite a government emergency warning that a typhoon was about to hit the Korean Peninsula. 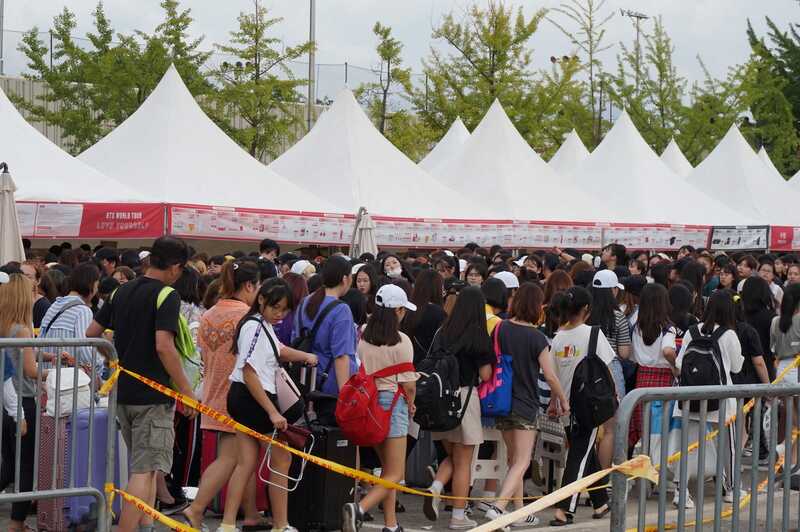 Armys are already in line outside the Olympic Park in Seoul. Please keep safe and fighting! ???????????????? 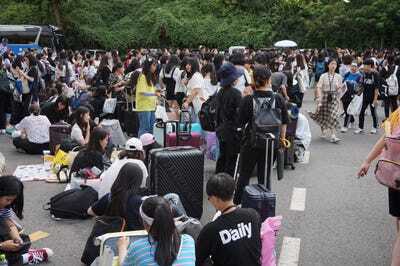 Raphael Rashid/Business InsiderFans waiting in line to purchase official BTS merchandise. …it was for merchandise! Loads of it. 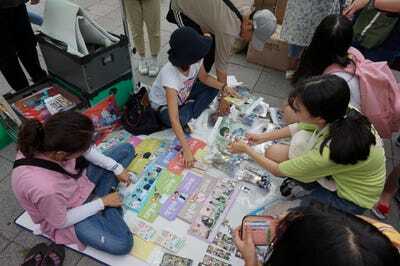 These fans from China showed me their treasure chest, full of stickers, banners, torch sticks and the likes. The price for the content of one suitcase? 1.2 million Korean won. That’s nearly $US1,100. 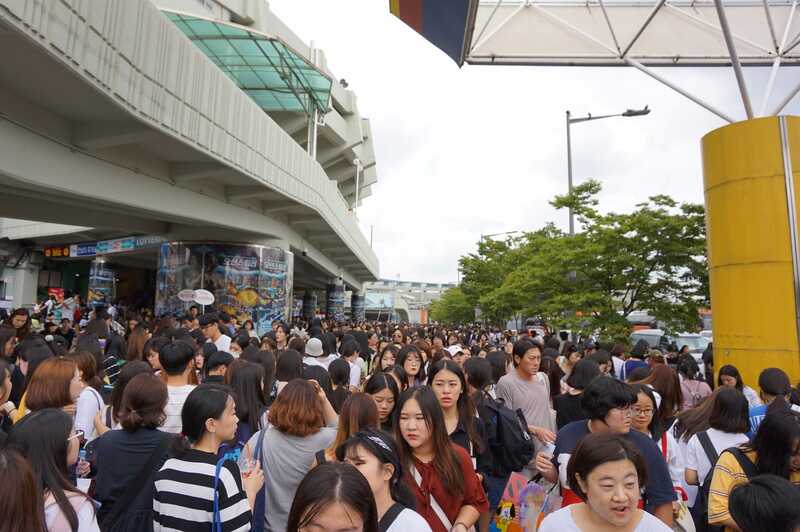 I couldn’t believe it, so I asked others around… but many admitted to having spent well over $US1,000 on BTS goods. Raphael Rashid/Business InsiderBTS fans show off their merchandise. I admit, this took me by surprise: a tax-refund booth, and a post office tent. But considering the sheer amount of die-hard international fans that flew in just to see BTS, it sort of made sense. 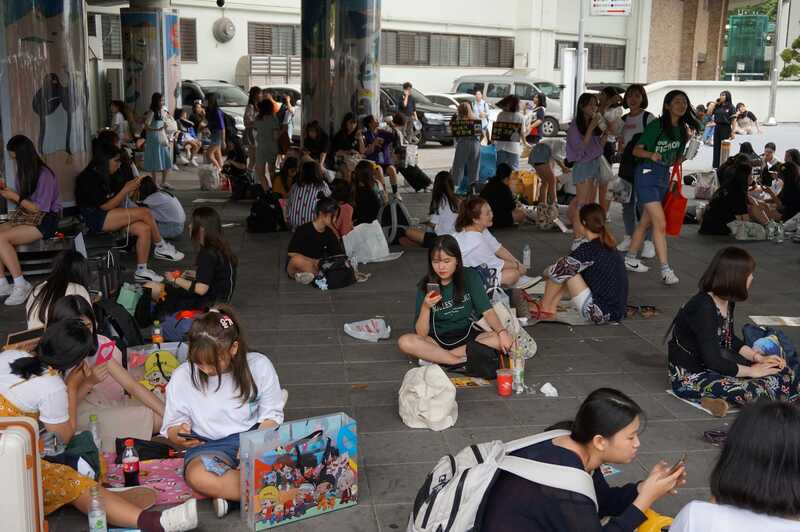 They spent hours, if not days, in line just to get hold of official merchandise, spending hundreds or thousands of dollars in the process. Duty free was actually a very clever move. The temporary international shipping post office booth was just the icing on the cake. 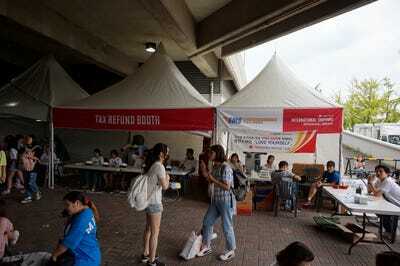 Raphael Rashid/Business InsiderTax refund and post offices makeshift booths at BTS concert. Vans and buses were decorated with massive pictures of favourite band members. These were, of course, all funded by various BTS Army fan clubs. 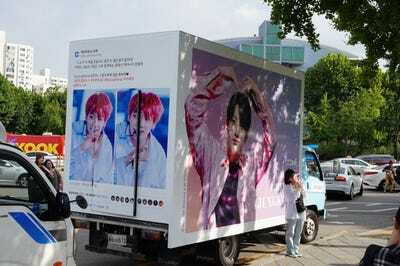 This van was decorated to celebrate the birthday of BTS member Jungkook. Raphael Rashid/Business InsiderVan portraying BTS member Jungkook. Raphael Rashid/Business InsiderSuitcases full of merchandise. Raphael Rashid/Business InsiderBanner distributed at BTS concert. The stalls were packed. So many people. My seat was at the very top, last row, but I couldn’t complain: this was an opportunity to see BTS live, in flesh. Living in South Korea, it’s difficult to escape their music. They are huge. And nowadays, absolutely massive abroad, too. Raphael Rashid/Business InsiderA full house. The sun was setting over the Olympic Stadium. The excitement was growing. OK, I think I was the only male in the audience, but yeah… five minutes to go! Raphael Rashid/Business InsiderSun setting over Olympic Stadium at BTS concert. And suddenly the BTS boys came out. They performed their latest single “IDOL” which is literally taking the world by storm. The single debuted on YouTube and has already become the most successful video launch of all time. Stating a current figure of how many millions of views the video has is useless: the number just keeps growing. Here’s some footage from all the action shot on my smartphone. Everyone was holding BTS lights, devices which can be paired to your seat number and will emit a specific colour to form massive patterns across the stadium. Except I would not be able to see this spectacle, because I was booted out the stadium for taking several pictures using a small hand camera. Raphael Rashid/Business InsiderFans holding BTS lights. The culprit? My Sony ILCE-5000. After all the hardships I’d been through to finally get hold of a ticket, I couldn’t believe this was happening. I had openly taken a few photos. Then one fan-turned- concert staff came to me, grabbed my hand and said, “No camera. Only smartphone.” I told her I (genuinely) had no idea and was sorry, but she insisted for me to come with her downstairs. I assumed we were going to store my camera somewhere. No. I was being kicked out. She took a marker pen and crossed out my ticket – essentially invalidating it. I pleaded with her that I really didn’t know that I was not allowed to take pictures: all the other fans had cameras and were taking pictures (high quality zoomed-in fan footage was subsequently uploaded on Facebook, Twitter and forums after the concert). “You broke the rules. Out! Get out! Can you not read?” she said, showing me a poster on the wall which stated in small print that cameras were not permitted. OK, I made a mistake. But I wasn’t expecting the aggressiveness. 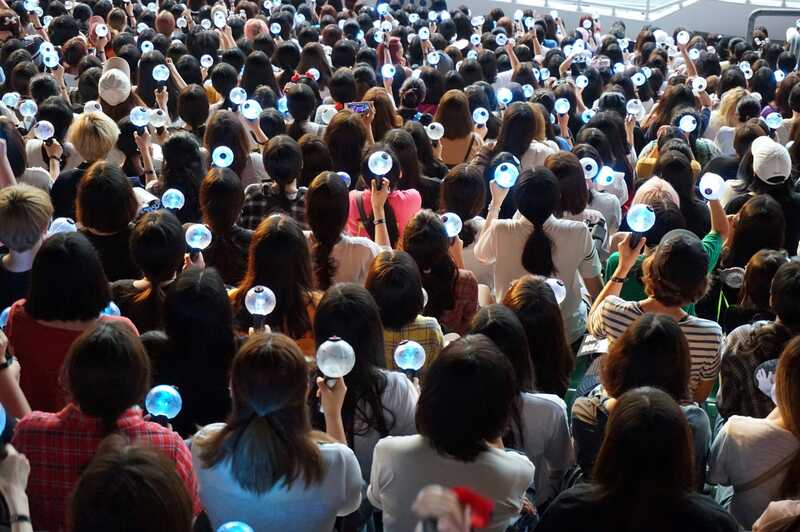 “This is a BTS concert -pictures have never been allowed,” she quipped, assuming that, had I been a true die-hard fan, I would have known the golden rules. “Get out! No refund! No re-entry!” she repeated, after which bouncers literally booted me out, and locked the gates behind me. I was stunned. Aside from the financial loss, I couldn’t believe how aggressive and protective staff were. A million questions were going through my head. Was I really that stupid not to know? Why no cameras? Why me? Why not every other person in the stadium with a camera? Why no storage? Why the rule? As I headed home, South Korean friends did little to console me. “This is K-pop – didn’t you know? We warned you this industry can be scary,” they said. 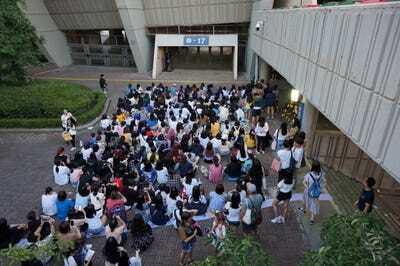 Fans outside the stadium lined every exit to try get listen to the concert for free. Raphael Rashid/Business InsiderBTS fans listening to concert from outside venue. Oh and those light-sticks? This is what it would have looked like. And of course, more suitcases, waiting for the merchandise stalls to open the next day. The entire experience was exhausting to say the least. Raphael Rashid/Business InsiderCamping overnight to purchase merchandise the next day. The entire experience, from buying a ticket to being kicked out, made me realise how obsessive fans can be, how protective they are, and how controlled the world of K-pop really is. All of the staff at the concert were young fans themselves. Their policing was as strict and unforgiving as the army. They were the BTS Army. And then I realised I can never be one of them.